SHINTO young priest | Send an eCard! 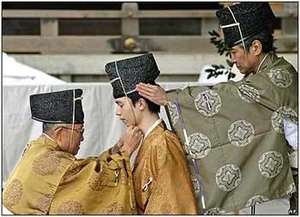 Shintoism is the largest religion in Japan, practiced by nearly 80% of the population. A young priest is being prepared to participate in a ceremony of sacred essence which manifests in rocks, trees, rivers, animals, place and even people can be said to possess the nature of God (kami).